As I was searching through Flickr photos that might illustrate the last post, I came across a couple of a WaMu bus stop ad campaign that I didn’t know about. One photo is from New York City, the other from West Hollywood. 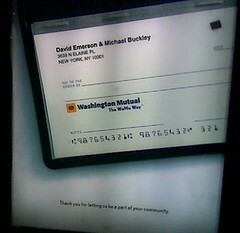 Each depicts an enormous checkbook holding personalized Washington Mutual checks. The joint account holders are “Kim and Katie” on the one ad and “David and Michael” on the other. Subtle and classy, in my opinion. Could we have more of this, and less “Whoo Hoo!”? fantastic post, very informative. I’m wondering why the opposite experts of this sector don’t notice this. This paragraph gives clear idea designed for the new users of blogging, that truly how to do running a blog. if you be acquainted with then you can write otherwise it is complex to write. Need sales & referrals? Running on a tight budget or simply don’t want to spend a fortune buying advertising space from high-priced traffic sites? You definitely came to the right place! all that for a fraction of the cost compared to regular advertising.